L'oiseau des îles ll modern and functional, specially adapted for navigation and sport fishing in the waters of Rodrigues Island. 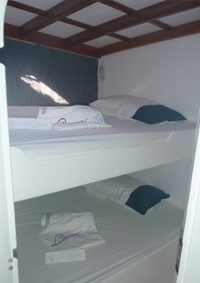 3 cabins: 1 cabin with double bed and two bunk cabins with double beds. Great storage. 1 bathroom with shower, lavabo and flushable marine toilets. The bed linen and towels are provided. Interior: red meranti wood varnished. Large lounge, spacious and comfortable. Cockpit to flybridge: large table with bench, ideal for rest between 2 doses. 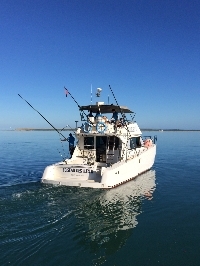 Electronics in flybridge: combined card reader, GPS, depth sounder FURUNO. 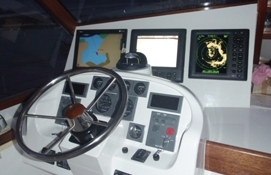 Cabin electronics: VHF radio, radar, GPS and digital colour sounder FURUNO, card reader autopilot. Unconditional Sea prevails on Rodrigues Island. 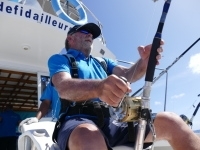 Cyril Faure, 43, frenchman, close to share his passion for fishing and put his technical and interpersonal skills to serve fishermen in search of new sensations. Perfectionist trained by Jean-Baptiste Esclapez (former world spearfishing champion), competitor and professional, he never ceases to "understand the fish" to find better. 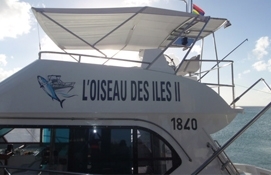 At the helm of L'oiseau des îles ll , he put all his experience of fishing and spearfishing to optimize each of your sea trips. 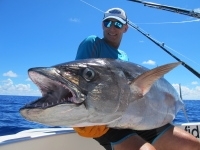 He surrounded himself with MARIO and STEPHANO, 2 very good rodriguan sailors : 15 years of experience in fishing in Rodrigues.